There’s something about the 1970s in particular that strikes a nostalgic chord in us. Whether it be the sepia-toned Polaroids of the just-out-of-reach past or the fact that we can recognize the start of our modern era in its changing times, there’s just that special something about the decade that makes it a slightly cooler time. And do you know how we could make our own era slightly cooler? 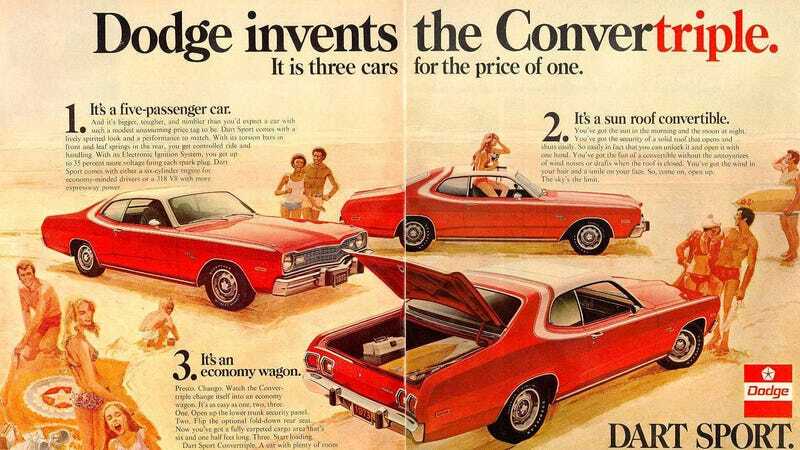 Let’s bring back 70s car advertisements. If we’re doing bell bottoms and suede again, surely it shouldn’t be too hard. Today, our advertisements are just… dramatic. Think of the last car commercial you saw that either: 1) makes a really bad attempt at proving that these are ‘real people’ experiencing the car for the first time; or 2) looked like it could have been cut from an action-packed kinda-car movie where they dedicate a solid minute to shots of a car driving through the desert to prove what a badass our hero is. But those one-page car ads you used to see in magazines? Man, those were something special. If you close your eyes, I bet you can picture it. Half the page is dedicated to a picture of the car they’re selling. Above or underneath, there’s a catchy slogan that grabs your eye, maybe makes you chuckle, maybe intrigues your smart sensibilities. And then there’s a couple paragraphs of description on the machinery you’re about to buy. It was a simpler time. These ads were down to earth. You could imagine your business savvy friend sitting you down to try to sell you on a car he just bought and fell in love with in the exact same innuendo and slang that your Hip Average Joe would be using. These ads were cheeky. They were clever. They were trying to get you to buy their car over anyone else’s in the midst of a decade plagued by gas shortages and 55 mph speed limit restrictions. And, most of all, they were doing a damn good job marketing to the crowd of youths eager for a little adventure, some good music, and an even better time. I’m sure there’s a whole host of big-brained professionals who have studied the psychology of marketing and are now producing the billboards and commercials we see today with the sole intention of selling the most cars. But, man, do they ever feel soulless. Even when they’re trying to be relatable, they don’t quite hit the same level of camaraderie that a good ‘70s car ad gives you. It’s time we bring this particular style of advertising back. The world could do with a little bit more fun lovin’ free wheelin’ attitudes. While I wait for automakers to acknowledge my correctness, here’s some of my personal favorite ads from back in the day. If this doesn’t convince you to hop back in time, I don’t know what will.